the greenDatacenter. The operator wanted absolutely reliable technology, technology that is better than state of the art and ahead of its time. R&M cabling definitely falls into this category. Application: Data network for a carrier-neutral TIER IV data center with 10 000 m2 usable space, structured cabling for leased spaces and caged racks, top of rack architecture, MPO and Cat. 6A connection systems, E-2000™* and LC connector systems, OM4 multimode and OS2 singlemode FO cables, copper cables for 1200 MHz bandwidth. One of the leading Swiss data center operators – the green.ch Group – demanded the greatest conceivable security and reliability for its latest project. Because the greenDatacenter to the west of Zurich was to offer high-profile, international clients optimal conditions for operating their servers. The suppliers not only had to offer uncompromising quality but also absolute reliability and continuous support. 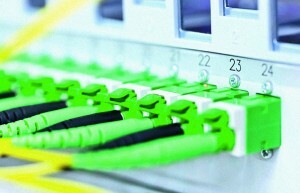 The green.ch Group selected the data center cabling program from R&M because it fulfilled all the requirements. Swiss quality, reliability, innovative strength and services met the customer’s high expectations. During the project, green.ch also got to know and appreciate the expertise, customer proximity, individual consulting services and fast logistics of R&M. Along with the soft skills, the technical advantages were also compelling. R&M’s interrack cabling provided considerable space saving. With R&M systems, a facility can be modularly expanded quickly and without complication. Alongside intelligent patch systems from Jost Elektro AG, MPO and Cat. 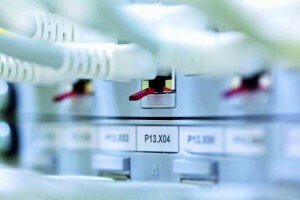 6A connection systems from R&M, E-2000™* and LC connector systems, OM4 multimode and OS2 singlemode FO cables as well as copper cables for 1200 MHz bandwidth were all implemented. The customers of the greenDatacenter appreciate the unbeatable security advantages of the infrastructure. The uncomplicated, convenient cabling accommodates their application requirements. They can set up their leased spaces and caged racks entirely to suit their own needs. In R&M, the green.ch Group has found a reliable partner.